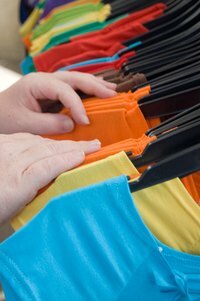 Men originally designed T-shirts as an undergarment to protect their skin from itchy, rough clothing. At the beginning of the 20th century, Southern European men began wearing T-shirts on hot summer days. United States Army personnel stationed in Europe brought home the popularity of the T-shirt after World War I. T-shirts eventually transitioned into appropriate women's clothing. Today, you can create your own custom T-shirt design using acrylic paints. In as little as 30 minutes, you can make an art project you can wear and show off to your friends. Pick out a shirt. If this is your first time painting on a T-shirt, experiment on an old shirt. Although any color shirt will work, white allows you the most versatility in paint color selection. Stick to light-colored shirts, as light-colored acrylic paint on dark shirts may not show up as well as you would like. Iron the T-shirt to get rid of any wrinkles, taking extra care to make sure the material is smooth where you will paint. Sketch out a design for your T-shirt on a piece of paper. Place a piece of cardboard between the front and back of the T-shirt, so the paint does not soak through to the other side. Draw the design lightly onto the shirt with pencil, so you know where to paint. Paint the design onto the shirt. If you like, you can paint on a foam stamp and stamp directly onto the shirt instead. Use larger stamps that don't have too much detail, as the detail might not show up well or might wash out easily. You can also use stencils, although these can smudge and be trickier to work with on T-shirts. Allow one color to dry before using another color. Large craft stores sell inexpensive T-shirts that work well for painting. For a different look, paint small or medium designs in unusual spots, such as on the right shoulder, at the bottom of the left front hem, or wherever you think the design would look best. Ironing the T-shirt after painting and before washing, inside out, helps set the paint. Wash a new shirt before painting it to remove sizing. Sizing keeps the paint from soaking into the material properly.